At Chenoweth Law Group, P.C., we provide effective advocacy in complex commercial and civil litigation. Our practice emphasizes business, real estate, land use, environmental, insurance, construction, and will, trust, and estate litigation. In addition to helping our clients resolve their legal disputes, we also work to keep our clients out of disputes through advice and drafting of their legal documents, such as real estate and business purchase and sale agreements, corporate documents, employment agreements, and estate planning documents. Our Portland firm has strong ties to the community. Our attorneys are active in a number of local organizations. Most of our attorneys have roots in the Pacific Northwest, having been raised or educated in Oregon or Washington. The hallmark of a successful law firm is its reputation in the community. Our reputation as a leading Pacific Northwest law firm stems from years of zealous advocacy for our clients in commercial and civil litigation, as well as transactional work. We receive referrals from lawyers and professionals across the Pacific Northwest who recognize us as leaders in litigation and entrust their clients and customers to us. Our reputation and track record demonstrate our successful and focused efforts. The Chenoweth Law Group has experience handling complex litigation at all court levels. We have represented clients in the state and federal courts of Oregon, Washington, and California, the Washington and Oregon appellate courts, the federal Ninth Circuit Court of Appeals, and the United States Supreme Court. Although our firm emphasizes complex litigation, we assist clients of every size with a wide range of legal issues, including real estate transactions, property development, regulatory compliance, business formation and advice, and estate planning. With attorneys licensed to practice law in Oregon, Washington, and California, we provide detailed, personalized legal support for clients throughout the Pacific Northwest and beyond. Legal problems often arise during difficult financial times, which is why we are one of the few firms that offers creative fee arrangements for our clients. In addition to our traditional hourly fee arrangement, we work for clients on a contingent and flat fee basis. We are also one of the few firms that offers fixed price work for certain aspects of litigation. Imagine if you could get greater certainty about the cost of litigation? The Chenoweth Law Group can give you a fixed price for certain types of litigation or certain stages of litigation. 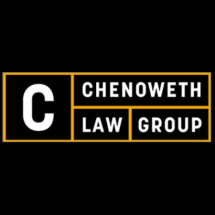 Our satisfied clients return to Chenoweth Law Group because they can predictably budget for their legal needs. Our clients also appreciate our detailed billing invoices showing the time spent on each task. There is no mystery in our invoices with vague time descriptions and block billing for the work we do. This ensures you see value in our services, not just a legal bill.